The Reluctant RoVer: Vacationing in Fruitland, Fla.
You would think that since we are retired, we don't need a vacation. The opposite is true. At home, we are busier than ever. Jim has a long list of to-do tasks (I don't call them "honey-do" because he creates the list himself), in addition to the "normal" stuff that takes up his day. He loves tending his garden and farming his worms. (Yes, he has a small worm farm. One box is for fishing worms, and one is for worm castings, which make excellent soil enhancements.) Then, there are "extra" tasks, such as fixing things that break down. He also spends time working on arranging his workshop, so that eventually he'll have the room in the garage to do woodworking. Me? House cleaning is not my forte, so I procrastinate until the dust accumulates so much I cannot stand it any more. I like to cook and bake. But mostly, I like to write. So I spend a lot of time on my computer. You might notice that I haven't mentioned fishing as part of our regular life style. We go out to our pond and catch a few bass every week, but we rarely take time to go surf, pier, or boat fishing while at home. We keep promising ourselves to rectify that flow in our lives. So, that is why we, as retired people, take vacations--to get away from it all. Right now we are at another state park. We have grown very fond of Florida state parks. They are very affordable; this one (Lake Griffin State Park) only costs $9 a night! As seniors, we are able to camp in state parks at a 50% discount. When we decide we want to camp, we start at the Florida state park web site and find places that meet our needs in terms of distance, activities, sites to see, fishing, as well as the number of nights we want to stay. This week we are at Lake Griffin State Park in Fruitland, Fla., next to Leesburg, which is near The Villages in east central Florida. It is a small park, only about 500 acres, and it is convenient to shopping. Unlike others we have used, groceries and other stores are only a few minutes (and about two miles) away. This is like an oasis in the city. Jim in front of the live oak tree in Lake Griffin State Park. 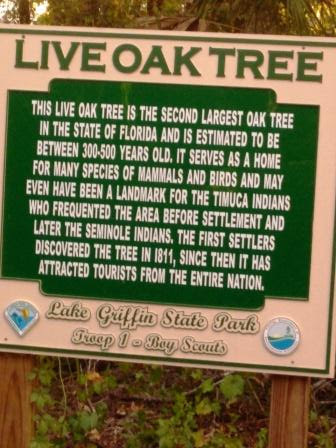 Lake Griffin State Park is home to Florida's second largest (and perhaps second-oldest) live oak tree. 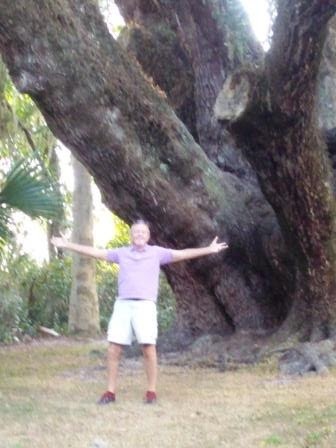 This live oak tree is pretty darn big. Some of its branches have obviously been removed. The huge live oak tree in Jacksonville has some of its branches propped up, in order to preserve the tree's integrity. 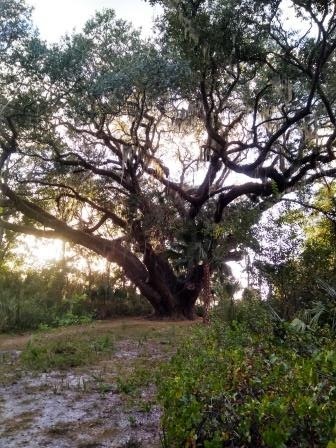 The live oak tree in the state park is estimated to be about 300 years old. The one in Jacksonville is about 150 years old. We chose this park because of its proximity to the many lakes in Lake County, and presumably, its good fishing. We are hoping to find some fishing piers. The one in the park looked promising on the website. Unfortunately, the pier is full of growth and the ranger said fishing there is poor. Fishing is good, she said, about a mile away on the lake. We don't have a boat. The park only has 40 camping sites, all of which are very private. We learned (after we had made reservations) that about 10 sites even offer sewer hookups! We are not inconvenienced by not having a sewer hookup, however. Our small RV has a tiny shower, so we actually prefer using the showers in the campground. We haven't gone fishing yet, but we will. Yesterday we spent "touristing" around the area. Although I have lived in Florida for 20 years and Jim for most of his life, neither of us has actually driven around and visited the central Florida area. We wanted to find the Lake County visitors' bureau to get information on what to do around here. We went to the address given on the website; it had moved. We were told where it moved; when we got there, we discovered it had been closed for several months! I guess Lake County (aptly named because of all the large lakes around here) doesn't want visitors! We will have to find our way around without maps and brochures, I guess. Last night, we went to a local street event, geared (we discovered) toward kids and sponsored by the local police department. Food and fun, if you were 10. There were a lot of people there. 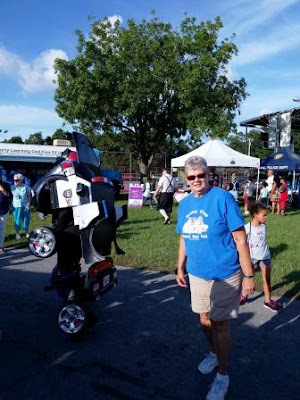 I am standing next to a "transformer" who captivated kids' attention at the local street fair in Leesburg. He actually got down on all fours and scooted via motorized wheels. Later today, I think we will go fishing. Or not. It just feels good to do nothing.